Our reception will take place at the Viscount Suite Hotel located at 4855 E. Broadway Blvd, Tucson, AZ 85711. It is located on Broadway Blvd and Swan Rd about 15 minutes away from the Newman Center. Our reception will begin at 4 in the afternoon. If you plan to stay at the hotel, a nightly discount rate of $79.00 is available for all of our guests Friday and Saturday nights. To get this rate, please call 1-800-527-9666 (9am-5pm), or (520)745-6500 anytime, and provide the reservation number D16A110D. Please reserve your room one month prior to the wedding (before May 25), since they will not be guaranteed after that date. We mention this only becasue the hotel will have at least one more wedding on the same day, and may not have enough rooms to accomodate everyone. We chose this hotel because it is conveniently located for our guests, and as the name implies, all the rooms are suites. Therefore, these rooms can accomodate more people then regular hotel rooms. We have reserved 40 rooms for our wedding guests. Please let us know if you might be staying at the hotel, so that we can reserve more rooms if necessary. If the Viscount Suite Hotel runs out of rooms, please let us know, and we will be happy to either reserve more rooms or suggest another hotel nearby. If you live outside of Arizona and plan on flying in for the wedding, there are several ways you could get to Tucson. One option is to fly in to Phoenix (Phoenix Sky Harbor Intl Airport) and drive to Tucson. Driving to Tucson can take anywhere from 1.5 to 2 hours. Another option is to fly directly in to Tucson (Tucson Intl Airport). The hotel and the ceremony site are about 30 minutes away from the Tucson Intl Airport. The following are our favorite places in Tucson and the surrounding areas. Sat. 7:00-8:00 Sun. 7:00-6:00 This is a local restaurant that specializes in a variety of bread and gourmet sandwiches. Robert and I love spending weekend lunches and dinners here. Sat: 4:30pm-10:00pm This is a local wine country restaurant. It is a small and romantic, and serves great french and italian food. Hours: Tue-Sat: 11am-3pm, Tue-Sun: 5pm-10pm This is a wonderful local sushi restaurant. It specializes in sushi and sashimi, serving amazing looking boats and platers filled with delicious food. But Sushi-Ten also serves non-fish japaneze food that is just at tasty. (520) 886-9428 If you visit the Gaslight Theater, you will be entertained by fun musical comedy melodrama, complete with honky-tonk piano playing, and sing alongs. You might want to buy the tickets ahead of time, since the shows are often sold out. (520) 621-STAR Flandrau houses a planetarium with daily shows, and a 16 inch telescope open to the public most nights free of charge. In the basement it houses the Mineral Museum, one of the largest university owned collections of gems and minerals in the country. 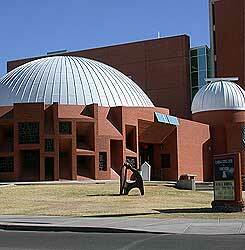 (520) 574-0462 The Pima Air and Space Museum has a large variety of helicopters and airplanes. It also houses the Titan Missile Museum and the Challenger Learning Center. Much of the museum is located outside, but it also has a large collection inside the main buildings and various hangers.